Kevin Bradley, Norwalk/McMahon: A senior, Bradley will look to once, again, lead his squad on the 1-meter diving board. The All-State athlete won the State Open title, earning 515.15 points last season. The Class LL diving finals saw him amass 572.15 points, giving him the championship. William Bryant, Ridgefield: Bryant posted a third-place finish in the 50 freestyle at the Class LL finals (21.53) for the Tigers and should be one of the state’s top sprinters. Charlie Clark, Greenwich: The junior emerged as one of the Cardinals’ most productive swimmers last season. He finished fourth in the 100 freestyle (47.02) at the State Open and was fourth in the 200 freestyle (1:44.10) at the Class LL finals. In the 100 freestyle at the Class LL competition, he swam to a third-place finish (47.28). Liam Colleran, Fairfield Prep: The senior earned the first-place medal in the 100-yard backstroke at the State Open as a junior, clocking in at 50.90. He also had a fourth-place finish in the 50 freestyle (21.53). An All-State standout last season, also won the 100 backstroke title at the Class LL finals (51.22) and was the runner-up in the 50 freestyle (21.82) for the Jesuits, who placed second in the team standings at the State Open and Class LL championships. Jack Crocamo, Seymour: Crocamo emerged as one of the top sprinters in the state, taking fifth in the 50 freestyle (State Open, 21.65). He was the runner-up at the Class S finals in the 50 freestyle (21.76). Ben Feldman, Westhill/Stamford: Feldman, a junior, turned in a sensational sophomore season, claiming the first-place medal in the 100 butterfly at the State Open in 50.08, then placing third in the 100 breaststroke (56.51). At last season’s Class LL Championships, the All-FCIAC Team, All-State Team selection won the 100 butterfly (49.62) and took second in the 100 breaststroke in 55.61. Spencer Erickson, Darien: A senior, the versatile Erickson was third in the 100-yard backstroke (52.10) and fifth in the 200 freestyle (1:43.14) at the State Open last year. The all-state, all-conference swimmer also won the Class L title in the 100 backstroke (51.77) and placed second in the 200 freestyle (1:43.05). Hadden Gaunt, Wethersfield: Gaunt finished second in the Class M diving competition last year (428.15) and placed eighth at the State Open (440.70). Ethan Godfrey, Glastonbury: The senior finished third in the Class LL diving championships, totaling 450.85 points. Connor Hunt, Ridgefield: The sophomore is coming off a season that saw him placed fourth in the 200-yard freestyle at the State Open in 1:42.78 and third in the 500 freestyle (4:36.38). An All-FCIAC, All-State selection last season, Hunt was second in the 200 freestyle at the Class LL finals (1:43.09) and was the runner-up in the 500 freestyle (4:37.46) last winter. Thomas Lewis, Greenwich: A junior, Lewis was sixth in the 100 breaststroke (LL, 58.66) and seventh in the 200 individual medley (1:57.40). He should be one of the Cardinals’ most consistent performers this season. 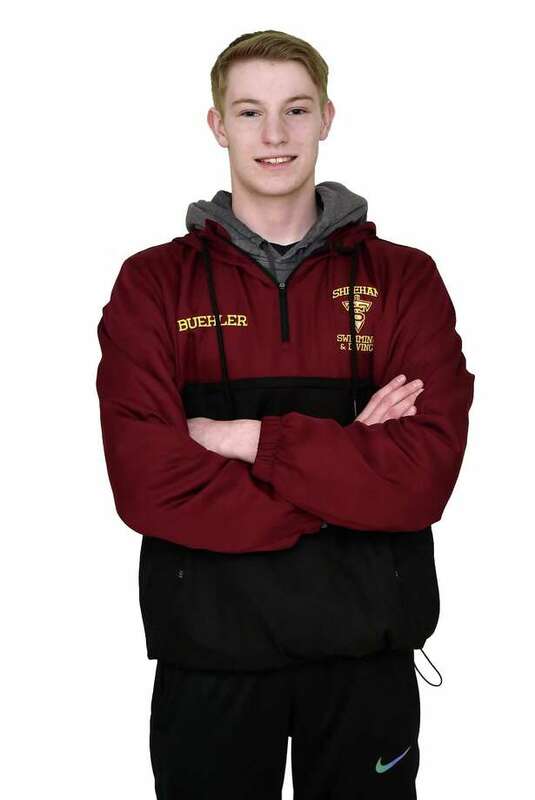 Colin MacKellar, Pomperaug: The senior finished second at the State Open as a junior in the 100 backstroke (51.91) and had a fifth-place finish in the 100 butterfly (51.70). He was third in the butterfly at the Class LL finals (51.62) and earned runner-up honors in the 100 backstroke (51.50). John Marcolino, Fitch/Stonington: Marcolino showed he was one of the state’s best sprinters at the Open, finishing third in 21.12. He also placed second in the 50 freestyle at the Class L Championships (21.53). Connor Martin, Darien: A junior, Martin won the 100 butterfly (Class L) with a time of 51.05 seconds and was fifth in the 50 freestyle at the Class L meet (22.11). At the State Open, Martin flourished in the 100 butterfly, garnering the second-place medal (51.07). McCallister Milne, Glastonbury: Milne helped spark Glastonbury at last season’s State Open, placing fourth in the 200-yard individual medley (1:53.87), while finishing among the top-10 in the 500 freestyle. He took fourth in the 200 IM at the Class LL Championships (1:55.38). John McNab, Staples: McNab produced a standout junior season in the 100 freestyle last winter, placing third in the event at the State Open in 46.98. He won the 100 freestyle title at the Class LL competition in 47.12 and was fifth in the 200 IM (1:56.09) at the meet. Richard Nolan, Fairfield Prep: Nolan was third in the 200-yard individual medley (Class LL, 1:54.69) and was the SCC champion in the event. He placed seventh in the event at the Open in 1:55.44. Billy Regan, Pomperaug: A senior, Regan is coming off a season in which he turned in a fifth-place finish in the 500 freestyle (4:39.18) at the State Open. He captured the 500 freestyle championship at the Class L finals, touching the wall in 4:37.60. Jake Ritz, New Canaan: Ritz should lead the Rams in the distance events, after recording a second-place finish in the 500 freestyle (Class L meet, 4:41.19) and finishing third in the 200 freestyle (1:43.89). He was sixth in the 500 (4:41.35) and eighth in the 200 (1:43.80) at the State Open Championships his junior season. Stephan Todorovic, Greenwich: One of the Cardinals’ captains, the senior helped Greenwich claim the State Open and Class LL championships with his versatility last season. He finished fourth in the 200 individual medley (1:53.58) and was fifth in the 100 butterfly (51.70) at the State Open Championships. At the Class LL competition, Todorovic won the 200 IM title in 1:52.71 and got the second-place medal in the 100 butterfly (51.55). John Tucker, Holy Cross: A senior, Tucker was eighth in the 100 butterfly (State Open, 52.28) and was the Class S champion in the event with a time of 52.26. Christopher Weber, Granby: His junior season saw him win the Class S 100 backstroke title (52.56), then finish fifth in the 100 backstroke at the State Open (53.11). Christopher Wu, Hand: Wu, a senior, posted a sixth-place finish (State Open) in the 100 backstroke last season, registering a time of 53.43. He claimed the gold medal in the backstroke at the Class M finals (53.41). Fairfield Prep at Greenwich, Jan. 19, 2:30 p.m.: The Cardinals and Jesuits finished first and second, respectively in the team standings at last season’s State Open and it’s always an exciting atmosphere when these rivals face each other. Fairfield Prep defeated Greenwich a year ago. Darien vs. New Canaan, Jan. 23 at New Canaan, YMCA, 3 p.m.: The Blue Wave/Rams rivalry also extends to swimming and their meets usually seem to go right down-to-the-wire. Greenwich vs. Ridgefield, Feb. 7, at Barlow Mountain School: The Tigers dealt the Cardinals one of their three regular-season losses last season and should once again, test defending FCIAC, Class LL and State Open champion Greenwich. Amity at Fairfield Prep, Feb. 12, 7 p.m.: Fairfield Prep has won 14 consecutive SCC Championships, but Amity is one of the conference teams that could test the Jesuits is Amity in this regular-season ending meet. Hand vs. Amity, Jan. 28, at Madison Swim and Racket Club, 7 p.m.: It’s usually a close meet when these SCC rivals duel and last season was no different. Amity edged Hand, 96-92, in a tense matchup. Pomperaug at Weston, Feb. 12, 6 p.m.: Pomperaug has captured the SWC title the past six seasons and placed fifth at last year’s State Open Championships. Weston, which was the runner up at the SWC Championships last winter, was 10th at the State Open. Glastonbury vs. Amity, Feb. 15, 5 p.m.: Glastonbury had a pretty close meet with Amity last year en route to its undefeated regular season.